If you’re looking for some light reading, might I suggest you check out the Federal Communications Commission’s report on The Information Needs of Communities (PDF) or at least Matthew Lasar’s summary of it? Okay, so maybe it’s not a light read, per se, but it’s worth your time. In it, the FCC dissects how the Internet has changed the media landscape for both good and bad. And, well, there’s some juicy stuff in there applicable to any business living in the digital age. While the report mentions plenty of positives that the Internet has brought like improved analysis, speed and ease of publishing, direct access to civic news, etc, it’s in the negatives (of course) where things get particularly interesting. Specifically when the council coins a new word to refer to the Web’s effect on journalists. That new word is “hamsterization”. According to the FCC, the Internet has changed journalism by introducing a motion-for-motion’s sake mindset in the world. Reporters have been forced to “regress” into producing a high quota of superficial stories which they THEN have to go and tweet, Facebook and share in ways they’ve never been required to before. Instead of going out and turning over rocks and doing investigative reporting, they’re doing Internet searches and are stuck in the time-consuming task of learning new technologies. Those poor, poor things! Except, most of that isn’t really true. The Internet didn’t create loopholes and laziness and you can’t blame the Web for the Internet marketing strategy you decided to use. It’s not the car’s fault if you voluntarily decided to drive it off a cliff into page view journalism. You were supposed to be steering it. The Web has changed journalism the same way it’s changed all business – by making content relevant and findable to a much larger audience than ever before, even if you’re someone like the New York Times. The FCC noted that in May 2010, NYTimes.com had 32 million unique visitors, royally trumping the daily circulation of its print edition which, in September 2010, came in at 876,638. More exposure to more eyes simply by keeping some SEO best practices in mind. Not a bad deal. I’ve already shared my belief that journalists need to stop resenting SEO and welcome it as a huge opportunity so I won’t do it again, even if most news organizations still prefer to drag their feet and scream like two year olds. That’s fine. Let someone else take your traffic. What I did find amusing was the FCC’s use of the word “hamsterization” just so they could give the Web a jab to the chest. Because, at least in my mind, the Web is what shatters that hamster ball. It’s never been what locks you inside. It doesn’t matter what business you’re in, take a few minutes to think about what you were doing BEFORE the Web. How were you marketing your business? Email newsletters? In-store events? Flyers? The Web gives you an opportunity to do what you were doing faster and better. It smashes the mediums that were confined and replaces the ones you can hack to do what you want. That’s why it’s cool. Of course, that’s assuming you were marketing your business before. Perhaps you were doing nothing and the rash of your competitors running to the Web has simply shown you that. If that’s the case, I can see why you’re a little perturbed. If you’re feeling stuck in a hamster ball, faking motion and doing things blindly and in volume, you should stop. Because it’s YOU whose driving your car off the cliff. But fear not, you’re not alone. There are plenty of others engaged in the same hamsterization. It’s the reporter who creates a Twitter and Facebook account with no social media plan for how it should be used. It’s SlimFast spending $120,000 to buy a promoted Twitter Trend only to fall asleep at the wheel while the promotion is going on. It’s big brand that hires an SEO company or a social media agency without knowing why they’re taking these steps or what they hope to gain. It’s the copywriter who churns out endless pages of content and ignores all other types of media (tweets, updates, videos, etc) because they’re unfamiliar with them. This happens every day, online and off. When you move blindly, with no idea of where you’re going or why you’re going there, that’s hamsterization. It’s not a product of the Web but rather when you zone out of your business. You can whine and moan and drag your feet all you want; you can refuse to adopt new marketing practices because they’re new, they’re hard, or because you think you’re too old for social media. Or, you can put on your Big People Pants and hop off the hamster wheel you were totally just called out for being on. The study put out by the FCC made me sad because it’s not helping. It’s validating the belief that the Web is hurting journalists and that social media is too much work for business owners. It’s not. If customers are your business, then social media and the Web are your two biggest tools. The future of business means incorporating all of these other approaches in a way that makes your business more understandable, more interesting and more complete. Maybe it is raising the bar, but it’s also giving you a great opportunity to be FOUND and to CONVERT and to MAKE MONEY. The Internet has opened a mall full of doors for business owners to venture through. 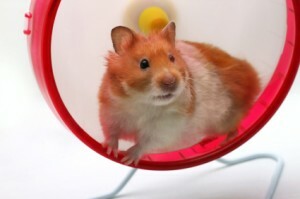 If you don’t want to be a hamster, get off the wheel. You put yourself on the path of mindless path views by falling for crap. Now that you’ve been called out – stop.